I know the title to this post isn't technically correct. Zombie's don't actually have zombie brains, at least I don't think they do. They want to eat live brains, right? I must confess I'm not entirely up to date on the Zombie Rulebook. 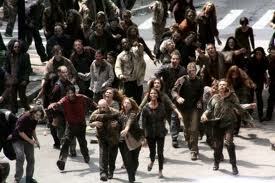 However, as I write this post I am suffering from a case of Zombie Brain. At my house it's a regular and reoccuring affliction that presents in a multitude of ways. Right now it's presenting as a small boy screaming from his bedroom, "You promised, YOU promised, YOU PROMISED you'd help me build this Lego set." If my current case of Zombie Brain was serious, I might lock myself in the bathroom and pretend not to hear the screams of perceived injustice. Since today's case is mild I first explained that promising to help and DROPPING EVERYTHING to help are two different things...then I locked myself in the bathroom. That's parental Zombie Brain, but I really wanted to talk about writer's Zombie Brain. There have been days when I've written thousands of words which have Persephone, the heroine of both Losing Beauty and Losing Hope (to be released at the end of this month) engaging in grocery shopping. "Persey looked at the apples piled in geometrical patterns. Should she buy Granny Smith or Honey Crisp? She leaned over and breathed in the scent of Autumn trips to pumpkin patches while trying to ignore the creaking wheel of her shopping cart." See, classic Zombie Brain writing, which is another way of saying I didn't know what to write about that day, which is another way of saying writer's block. If your mind is paralyzed, stopped dead in its tracks by a bad case of Zombie Brain, it's not such a bad thing to write about the mundane details of your MC's life. And the best news about Zombie Brain is it's easily treated. Reread, highlight, delete and those boring, irrelevant passages are excised as though they never existed. Now, if only I could come up with a quick and easy fix for parental Zombie Brain that didn't require a door with a working lock. I swear you need a degree in engineering to put together a Lego set these days. Good luck with that. As for the zombie writers brain, I like it. I can totally relate. My MCs seem to make dinner a lot. Maybe our MCs should get together since yours seems to enjoy doing the shopping! I need to come up with a new main character first. Maybe you can rent out your children for the day? Shell, sounds like a plan! Alison, I hosted the same sleepover on Friday night. Alex, are you saying I could make money from them? What a novel thought. Naida, really? Was so hoping there would be. Oh, I SO can relate to 'parental zombie brain,' - you can run but you can't hide from the little people in your house! AGH! Yeah, I'm spotting some of exactly that... micro-minutiae because when the plot isn't FLYING, I seem to have to write every single thing that happened. Zombie brain is a good way to put it. I'm formatting a book right now, so I can relate to the zombie brain. Boring but it has to be done. I love this. I definitely get Zombie Brain and I'm glad I now know what to call it. My characters don't usually shop. They either drink and ruminate or describe every single solitary thing in sight. Great post! I get Zombie Brain about half way through revisions. Up until then I think my book is publishable, but after that, I think it stinks pretty much up until I query. Ha! 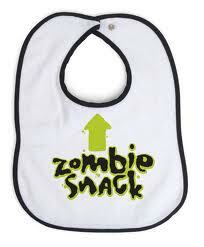 That bib with "Zombie Snack" and the arrow made me scream with horror and delight at the same time. It ought not be funny, and yet it is. Kind of like the Far Side cartoon with the snake in the playpen with a big bulge in its tummy. I love Legos. Had them as a kid and play with my kids with them too. But they sure have gotten expensive. Sadly, I have parental zombie brain often. Let me know if you find the cure! 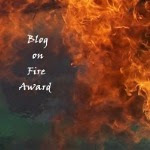 I've also had writers zombie brain and the attack of the mundane. Delete is my friend in those cases. As for son? At least he's relatively quiet in his room and watching TV. I can live with that after a long day working. It was either that or violence and I'm too tired for that or even threatening because if I threaten I have to follow through--Parental law 25C in the book of Mom. Wow! Today I had Work Zombie Brain! 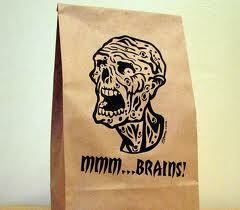 The mind-numbing stupidity I encountered today made me want to eat my own brain!! Going home and chillin' for a few with my iPod got me back on track for the night. LOL...I have a 10 year old, so I know all about perceived injustice, too. I agree, even if you have writer zombie brain, just write anyways and edit later! I agree, writing through it is the way to go. I've found that chocolate and/or coffee is a pretty good treatment for Zombie Brain. That's why I often write in cafes. I let my 13 year old genius daughter put the lego sets together for the 7 year old. She's ridiculously good at it so it saves me some serious "helping." Zombie brain writing...? Me? p-shaw. Your Zombie (parent) Brain sounds like it was stolen from *my* brain, but alas, he says, looking skyward, my six wrinkles remain in my brain. Yes Zombie brain does freeze us in our tracks~ I love this comparison, so fun to read! I'm enjoy the month of monsters ;D Very clever!